This new fire test instrument was designed by Dr. Richard Lyon and colleagues at the FAA. This instrument, standardized as ASTM D 7309, quickly and easily measures the combustibility or pyrolysis (aerobic or anaerobic) of materials, such as plastics, wood or textiles. Samples are only a few milligrams and results are obtained in minutes instead of hours or days. The MCC is a low cost technique, available with FTT’s data analysis software. Data from the MCC has been shown to be capable of being correlated with other standard heat release instrument fire test data (Cone Calorimeter, OSU) and other flammability results (LOI, UL 94). The data is also consistent with data obtained from an oxygen bomb calorimeter. 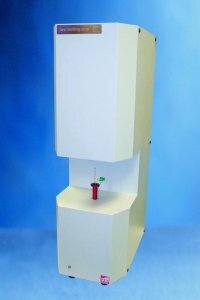 As such, the micro calorimeter can be a powerful, low cost tool to assess and predict flammability properties. The MCC technique utilizes traditional oxygen depletion calorimetry. The specimen is first heated at a constant rate of temperature rise (typically 1-5 K/s) in a pyrolyzer. The thermal decomposition products are swept from the pyrolyzer by an inert gas. The gas stream is mixed with oxygen and enters a combustor at 900 ºC, where the decomposition products are completely oxidized. 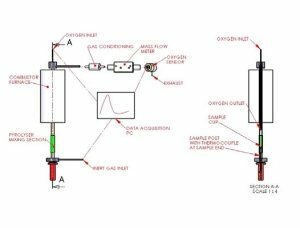 Oxygen concentrations and flow rates of the combustion gases are used to determine the oxygen depletion involved in the combustion process and the heat release, as well as the heat release capacity, is determined from these measurements.